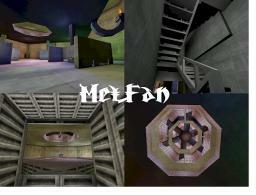 why there is alway's ''Mel'' in every map ?!?! Now things are looking waaaaaaay better than any of your other levels, much better. I thought for sure I was gonna get decapatated jumping up there heh. But your getting better, the only thing wich I think you know is the stairs came out to snagy, next time think 256 for widths so you don't get caught up too much on the geometry. 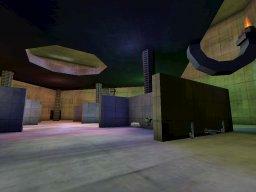 Scoring a 6.5 because I see a much more appealing feel when your in the map than any other one you ever did so far. And some strategy is built in not just grab the redeemer, you got to work for it a little bit, wich in turn you may loose the match trying while others are getting points. Will download later, buit the screenshots actually have, like architecture and stuff! The Stairs looked nice,but they are far too thin. They were really the only thing I nearly liked. Bots all in one spawning in the same area was very difficult,regarding finding weapons etc..3 Bots have Rippers and you,on your own,with that AssaultRifle..I found spawning alot to be my objective! I must add though that the bots did run around well,so a 4 for your trouble. Edit: The torch-flames gave off a green light...PLUS I have downloaded one of your other Maps.This one here is better. Really nice map, but I 3rd on the stairs.